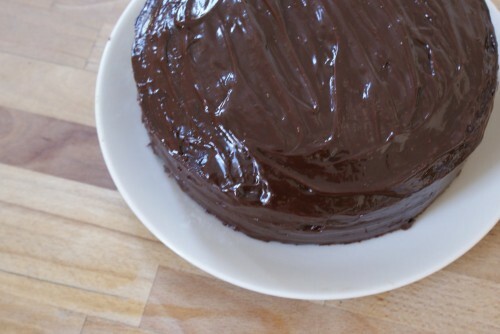 This is the easiest recipe for chocolate cake and it leaves you with a fudgy, dense moist cake. The best bit? it uses vegetable oil for fat and cocoa instead of chocolate. Ok, so that doesn’t sound so appealing, but believe me you don’t notice and it does make it a very cheap cake to make. Everyone I have ever made this for loves it. Smothered in a simple chocolate ganache, this makes the perfect birthday cake, or just a Monday afternoon cake. Make sure the cake is completely cool before attempting to ice, too many times have I let impatience get the better of me and ended up fighting back the melting whipped cream (and the tears) as it cascades down the side of the cake. It’s perfect iced simply with chocolate ganache, but an easy grown up version would be to fill it with mascarpone and raspberries. Mascarpone, although a little more expensive than double cream, is great because all you need to do is stir it vigorously with a little icing sugar and maybe vanilla until it’s soft and billowing like a dense whipped cream. For a less grown up version, sprinkle the cake with hundreds and thousands before the icing sets. To ice a cake successfully with minimum mess, try tearing 4 long strips of greaseproof paper and placing them on the edge of your plate. Top with the filled cake and do one layer of icing. The greasproof paper means you can be as messy as you want (within reason), you’re going for general coverage here, trying to make the surface as smooth as possible in a thin coat of icing. Let this chill in the fridge before doing the second layer. Once dry, pull the strips out from under the cake for a perfectly clean plate. Preheat the oven to 180C and grease and line two 20cm sandwich tins. Add all of the ingredients, except the boiling water, to a large mixing bowl and stir until well combined. Add the boiling water and mix it in well. The cake batter will be very runny now, don’t worry! Divide the batter between the two sandwich tins and bake in the oven for 25-30 minutes, or until the top of the cake is springy to the touch. Remove the cakes from the oven and allow to cool completely before icing. Wait until the cakes are completely cool before icing. Place four strips of baking paper (or just normal paper) on the edge of a plate and place one of the cakes on top. Pour half the cream into a large bowl with 1tbsp icing sugar and whisk until softly whipped (the peaks stand up by themselves). Spread this over the cake on the plate. Top with the other half. Melt all the icing ingredients in a small saucepan, stirring gently. Keep whisking until it become thick and glossy. Ice the cake in 2 thin layers, chilling in between. This looks really good, and I quite like the idea of using vegetable oil rather than butter sometimes! There seems to be quite a lot of sugar – does the finished cake turn out quite sweet? Love the glossy finish too! Yes, there is a lot of sugar – the original recipe was in cups, so somehow you don’t notice quite how much sugar you’re adding! 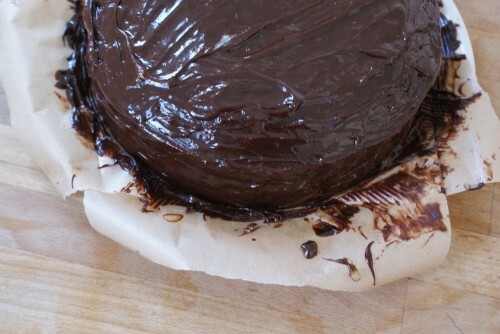 The cake doesn’t come out overly sweet, but you could certainly cut down the amount of sugar…. I made this last weekend and it went down a huge hit with my family and friends! Thanks for sharing it. Great! I’ve made this cake soo many times and people always love it. Baked this yesterday (got the recipe from the BBC website) and went down an absolute treat! I messed the icing up a bit though. I have made this cakes loads of times its brilliant i was looking for the ultimate delicious and easy cake and this fits the bill it even holds for a few days without drying out. I want to make a large one for my daughters 18th for approx 50 people how should i multiply it up to a large rectangular shape. im guessing 2 9x13inch tins? any help would be most appreciated. Thank you! Hope this reply isn’t too late! I used this recipe for a wedding cake and I made 3 x the chocolate cake recipe in a 12in square tin which should serve 50 people easily. You could probably make this is in a 9×13 tin, it would just be a bit higher. You could then cut it horizontally two or three times and fill with icing. Do you think this would work if I substituted flour for gluten free flour?